I’d like to say thank you to MLBlogs for featuring Prose and Ivy on the MLBlogs home page today. After participating in the I-70 Baseball Blog Talk Radio podcast, discussing the outlook for the NL Central in 2011 last night, I thought perhaps the increase in traffic that I noticed on my site this morning was based solely on my appearing on that show. The photo they used is a photo that I included in a post on here called ‘New Beginnings’ back in October or November of last year. If you click on the October and November links for 2010 in the sidebar you’ll be able to find it. The last thing I expected to see when I went to MLBlogs.com today was to see a picture of my son, Rhys and I with Prose and Ivy showcased as their featured site. It’s very cool of Mark and everyone at MLBlogs to take the time to promote the blogs that we all put so much time and effort into as bloggers. I appreciate them bringing my blog to the forefront today and introducing me to new readers, as they do any time they showcase any of our MLBlogs. And honestly, could I ask for a better description? “Vying for the title of King of All Media…keeps readers engaged with consistently strong writing and a dose of humor”. All I can say is I’m glad they enjoy it and I appreciate the encouraging words and support very much! I really think MLB.com gets it right and does fan relations better than any other league (yes, even if they hadn’t showcased my blog). From the MLBlogs community as a whole, to the blogger features, the recent activity list, the monthly top 50s, the annual top 100, asking bloggers to contribute content to various articles for a byline on MLB.com and the interaction you get from the social media team on sites like Twitter. The NFL, NBA, NHL and any other sports league trailing behind these guys in fan turnout or even lacking in audience as a whole could learn a lot from Major League Baseball. Thank you to Mark Newman and everyone at MLBlogs.com for helping bring my blog to a wider audience and making my son’s day as well. Now, something I’ve wanted to share with you for a couple weeks is how I feel that the Cubs organization exemplifies the level of class a team should have in relating to their fan base. I was going to dedicate an entire post to it, but this seemed like a great opportunity.A little while back, about a month or so ago, my son Rhys ended up admitted to the pediatric surgical wing at a hospital in New York City. He had a minor surgery but because he was only seven weeks old and they had to put him under to perform it, it was semi-serious considering that’s always a scary thing to have to do to someone so young. He is fine now and I’m happy to report all is well. While I post often on this blog about the Cubs and their progression or regression (whichever is appropriate) during the off-season and throughout Spring Training/regular and post-season, I also am very active on Twitter. Some of you probably follow me and if not, you can at @proseandivy. The Cubs fan community on Twitter is a group of people that I have come to admire and truly enjoy communicating with. It can be about the Cubs, baseball in general, or even the most mundane detail in life or pop-culture as we know it. My tweets are generally full of sarcasm and humor and I find the one-upmanship challenge with other people on there to be entertaining and inspiring. Once you feel you have something that’s funnier than anything else that can be said about something…boom…someone else posts something even funnier. And you try to top them and on and on we go. Occasionally though, things happen like deaths in the family, scary surgeries or exciting moments like the birth of child. That is when the Twitter community really steps up their game and let’s you know they’re there for you. When I mentioned that Rhys was having surgery and that I felt no seven week old kid should have to go through this, it was overwhelming the response I received from people on Twitter. The well-wishes and prayers that flooded my timeline meant a lot to me, there the Cubs community on Twitter was again, stepping up when it mattered the most. 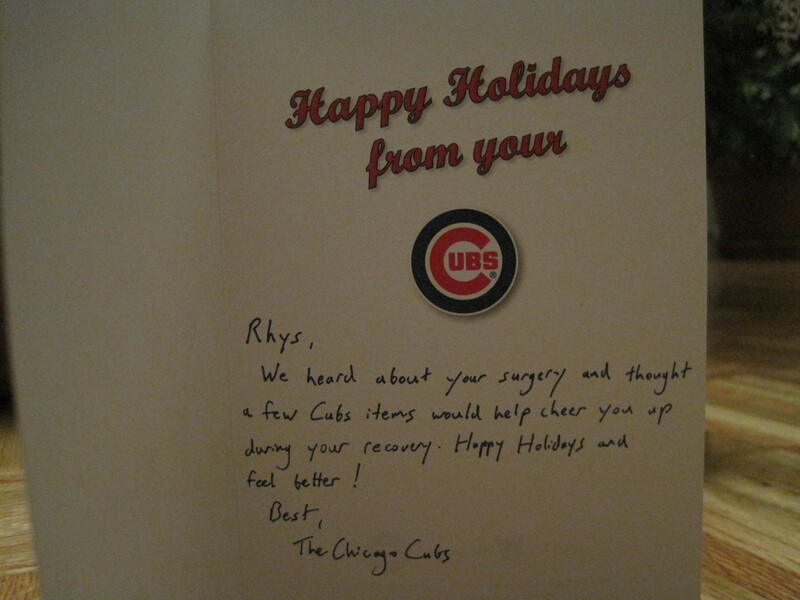 During this exchange, the Cubs social media team heard about Rhys’ surgery and after sending their best wishes that all turns out well, they took it a step further. They direct messaged me and said, “Hi. A few of our mutual followers told me about your son’s surgery. Is he a Cubs fan? Perhaps we could send him some stuff to cheer him up.” Well, of course Rhys is a Cubs fan (or as the photo on the home page today put it ‘Cubs fan in training’). That’s all Kevin from the Chicago Cubs’ team needed to hear. He said he’d try to get something out soon. Once we arrived home from holiday travel, the coolest thing was waiting for us. A box. Addressed to Rhys. Well, Rhys only knows so many people, so who could have sent Rhys mail? A relative perhaps, sending a gift we didn’t get to exchange in person? 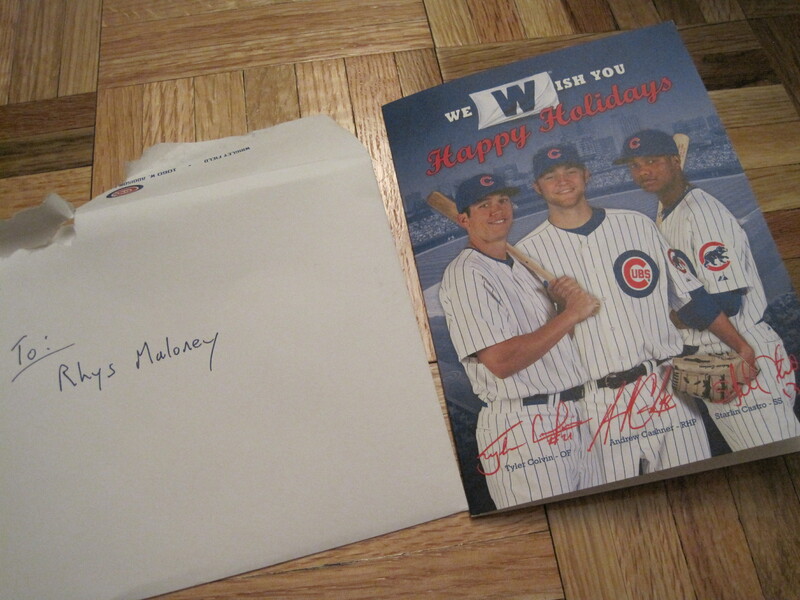 Addressed to Rhys…..from…1060 W. Addison Street, Chicago, IL. Oh my God. 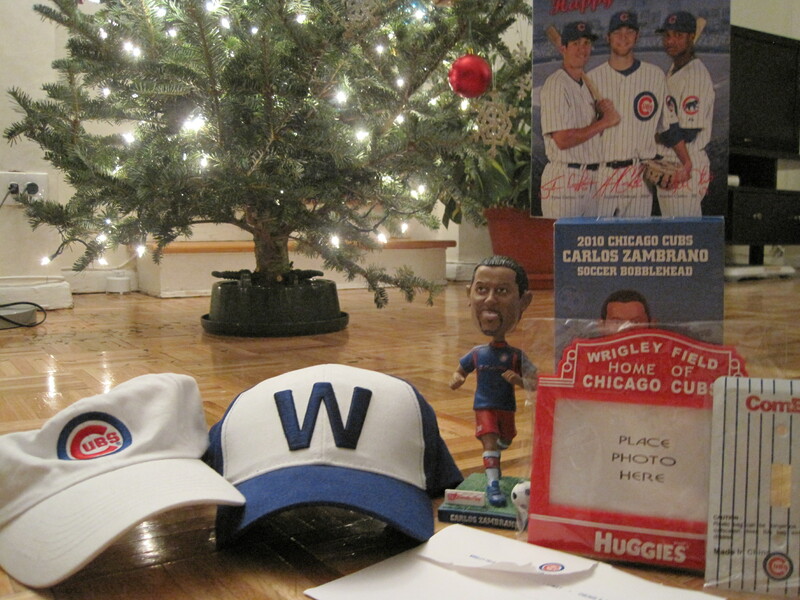 Rhys just got a package from….THE CHICAGO CUBS!!!! We couldn’t wait to open it. We rushed upstairs to our apartment and immediately opened the box. I’ve included photos below of what they sent to Rhys, items that will forever decorate his room and keep our family talking about for years to come. The coolest part however, was the card that was included. The thought that went into the package and the sentiment in going the extra mile for a Cubs fan truly made me respect the organization even more than I already had. I’m already a Cubs fan and of course, Rhys is as well. But how many kids are lucky enough to have someone with enough class reach out and go the extra mile for them when that person doesn’t even know them? And how many of those kids have that person reach out to them from their favorite baseball team? Think about that. Think about the days before social media. What were the odds you’d get to communicate with your favorite ball club, or have the open-door type relationship we have with our favorite teams today. It probably never would have happened in our days as kids and even while it can today, how many teams would take the time to do something so thoughtful? I can’t speak for the other teams, but when it came to the Chicago Cubs…they stepped up and showed nothing but class. One day, Rhys will truly understand and appreciate what it meant for someone from the Cubs to take the time and try to cheer him up after what was a scary situation for all of us.The Cubs aren’t perfect, nor are their fans and neither groups ever will be. They will always make decisions that we won’t always agree with and we will always take the good with the bad because that’s part of being a fan. On their side, all they have to do is have enough players on the roster to fill out the jerseys that they sell to their fans and put enough butts in the seats to keep the organization thriving with enough hope in their fans’ hearts to keep them coming back to Wrigley and supporting them on the road for years to come. What they don’t have to do, is go the extra mile for any of us. They really don’t have to. However, in this case, the Cubs did just that and I really appreciate it. 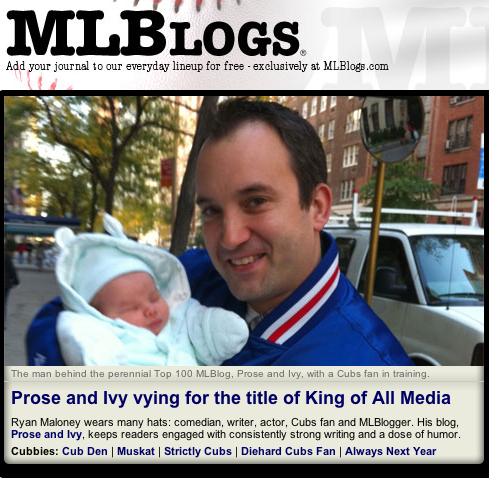 It says a lot about the team and the league as a whole.I realize the section of the MLBlogs home page where Prose and Ivy was featured is always a segment of the site that features a random MLBlog. However, while they take the time to showcase us bloggers, it’s right to take time and acknowledge that in this aspect of the league/fan relationship, MLB does it right. They do a great job keeping their fans interested, interacting and into their team year in and year out. There will always be something to complain about in life, but sometimes it pays to stop and be grateful for the cool things people do for you when they take the time to do so. So, thanks again to the MLBlogs team for the plug today and to the Cubs. Once again…total class and thank you. Go Cubs Go! @proseandivy Awesome, I hadn't heard! Way to go @CubsInsider. Monday night, I had the pleasure of making a guest appearance on Bill Ivie’s I-70 Baseball Radio podcast on blogtalkradio.com. It is a great compilation of Cardinals and Royals fan bloggers and always a fun listen. This particular episode, they gathered up bloggers representing every team in the NL Central. I took part in the panel discussion and made my case for the Chicago Cubs winning the Central in 2011. Some of you may have already heard it as it was their highest rated episode since launching in July of last year. (For a more in detail description of what I expect out of the Cubs in 2011, check out the post below this one). It really was fun to do and I think you’ll enjoy it. The Cardinals fans hope they lock Pujols in before Spring Training although they don’t think it’s a hard deadline, the Pirates fans seem to believe they will once again finish in the basement of the division, the Brewers folks are confident they will contend and everyone (except me) believes either the Reds or Cardinals is the best team in the Central. Pretty sure they thought I must be delusional to think the Cubs can pull this off in 2011, although Bill Ivie was on board with the concept that it’s not impossible for things to fall into place and make 2011 the Cubs’ year. Hey, crazier things have happened and this division is going to be one of the tightest in all of baseball. Listen to the show by clicking here and let me know what you think! Those words are uttered in only two cases. Absolute disasters, or sports miracles. It’s kind of bizarre, but in no other situation do you ever hear of anyone saying that the world was shocked. Ever. Even with Obama’s election, perhaps some of the world was surprised but no one stated that he had shocked the world, or that our country had shocked the world given our election’s result…and that was a historical Presidential election. Many would consider the Cubs winning the World Series to be an absolute sports miracle. If the Cubs were to in fact win the World Series, become the champions of the world in the world of baseball…you can bet a LOT of money that someone will use that phrase. Someone will flat out state that the Cubs’ victory over the Boston Red Sox (yeah, that’s right, the Boston Red Sox) surprised the entire world, our entire planet, so much that it is in shock. Chicago? Certainly. Boston? Yes. Canada? Um, ok. Bangladesh? Paris? Sydney? Helsinki??? Intrigued? Perhaps? Shocked? No. If the Cubs were to win the World Series then yes, someone will say they shocked the world. In reality? They would have made millions of Cubs fans VERY happy and many baseball fans or people who have a heart would happily give them a pleasant smile, perhaps a teary eye and a ‘that’s cool’ sentiment considering the over a century long drought the team has suffered through and well, to not feel something towards a group of people who suffered for so long…yes, you’d have to be heartless to not. However, I feel shocked is a bit of a stretch. The streak itself lends itself as the only evidence you truly need to NOT be shocked by the Cubs winning the World Series. Over ONE HUNDRED years without a championship. Others have done it much more quickly. The Mets. The Marlins. In fact, every single team that has won a championship has done it within a shorter waiting period of time than the Cubs would have with the current streak at 102 years and counting. Give me a break ‘shocked’. The Cubs are DUE. You know what I think would be shocking? If the Royals win the World Series in 2011. If the Pirates win the World Series in 2011. If the Orioles win the World Series in 2011. And yes, even if the Phillies win the World Series in 2011 I’d be shocked because how often do you actually meet expectations and nothing goes wrong for your team to stop you from what should have been an easily accomplished, obvious to predict feat? In each of those scenarios, I would be SHOCKED. If the Cubs win it? Not so much. Surprised? Elated? Thrilled? Speechless? Relieved? Absolutely. But after 102 years and with the roster that we have (that’s right, the roster that we have) I believe in one of the other age-old sayings in sports when it comes to predicting how a season will turn out. And that is: Why not us? And really, why not us? As far as I’m concerned, great teams need five key things to win it all and I believe the Cubs have the potential to meet every single criteria. Pitching, youth, veteran leadership, wise management, luck. Some are MUCH harder to come by, but I see no reason why the Cubs can’t land the money ball in every single category. PITCHING: Our starters were great when it came to quality starts in 2010. Dempster is about as reliable as it gets and a great guy to have in the clubhouse. He’s the rock of the rotation for 2011 now that Lilly is gone and there is no reason to think he can’t be the leader in the starting five. Zambrano is equal parts talent and equal parts imbalance. That’s what many believe, I don’t buy it. Zambrano is extremely talented and capable of doing great things, proven in his overall Cub record, leading the team in the past five Opening Day starts, throwing a no-hitter, being a dominant figure on the mound and the way he finished the second half of last season. If he can start the way he did last year and finish the way he did last year, then Zambrano might just be capable of handling just about anything. And what are the odds that he will go from Opening Day starter, to bullpen, back to rotation with head issues in between mixed with being the center of a lot of team drama? Chances are that’s not going to happen again. I like Z’s chances of having a real quality 2011. Wells is working on showing people that his first year is the real Wells, not the sophomore slump guy we watched in 2010. I like that he can admit that he grew too big for his britches last year. Talent is great but mixed with maturity, it can go a long way. Silva/Russell/Cashner are practically interchangeable. No matter who ends up staying with the club, they will be the Cubs’ fifth starter and usually .500 seasons out of your number five guy is about all anyone hopes for. I know they are all capable of giving us that if not greater ALTHOUGH, if it’s not Russell, all we’re looking at are righties in the starting rotation. (That can’t be good). And of course, the Cubs’ new toy for 2011…the new piece on the showroom floor: Matt Garza. I was disappointed when I heard we were bringing in another guy this off-season but his name wasn’t Carlos. I really want to lead the league in Carloses (Carlosi? Carli?). I’m kidding….Matt Garza is possibly the missing link the Cubs have been looking for. 15 wins last season, an ALCS MVP and an all-around solid pitcher. Coming from an environment and culture similar to the Cubs where no one expected much, he knows what it is to help get a team from the basement to the penthouse of an incredibly competitive division. I like the Garza signing. I don’t think we gave up too much for him and I’m excited to have him as a key part of the Cubs starting rotation in 2011. Marshall/Wood/Marmol. Is there a better bullpen trio in the league? Maybe only the Yankees and that’s only because they landed Soriano to match with Rivera. Rivera is a legend, but he’s also another year older. Even if they make the Cubs #2 in the league, I’d take it because in the grand scheme of things, being number two in the league regarding your top three bullpen guys is pretty damn good and nothing to complain about. I love the talent and potential we have to close games out now, starting with a lead going into the seventh and holding it throughout the rest of the game. 2010 was horrible for the Cubs when it came to one-run decisions. This next season? Not so much. The Cards are strong with their 1-2 punch in Wainwright and Carpenter. The Reds are impressive with their young staff coming off a division title. The Brewers always seem to compete and will do so with Greinke in 2011. It’s not going to be easy, but pitching wins championships and I feel comfortable putting the Cubs staff up against any one else in the Central. C – Geovany Soto – Talented young catcher, one of the best in the National League. Coming off an off-year last year but recently signed an extension with additional money/increased salary. He’ll be looking to show the Ricketts and the fans that the Cubs didn’t make a mistake in signing him and avoiding arbitration, or for counting on him even after shoulder surgery (probably the key reason he was only signed to a one-year deal…again, man, this is the year of the one-year deal, isn’t it?). Also, all we have behind him is Koyie Hill really, so Soto, you have no choice. You need to be awesome…no relying on Koyie. Thanks. 1B – Carlos Pena – Our latest Carlos addition to the Cubs. Pena batted under .200 for the season in 2010. He was one of many one-year contracts that were doled out in the off-season (do that many people think they have a shot at Pujols?) and he is expected to bring the power bat necessary to replace Lee’s spot in the order. His glove is supposed to be reliable and his power numbers shouldn’t suffer at Wrigley. I like the signing, I think it has a lot of potential to work out and I believe his BA will rebound. God, help us if it doesn’t. I’m tired of anyone thinking Colvin is a good option at first and Lee’s already been exiled to Baltimore. This has a lot of potential to work and if he stays healthy, I believe it will. 2B – Blake Dewitt – I don’t expect much out of DeWitt and I believe Baker may even replace him come June or July. However, with the other guys in this line up, second base is a place that we really just need the flash and reliability of the glove on defense, not necessarily a whole lot of RBI. Just get on base and set the table for the guys we’re paying to knock in the runs Dewitt and we’ll all be happy. SS – Starlin Castro – The club already has ads sporting Castro against Jeter, so yeah, the organization is high on Castro. All of the Cubs Con materials feature the youthful stars of the team and Castro, after finishing in the top 10 for the NL in hitting his rookie campaign is among the top of them. No sophomore on the team is expected to do more than Castro is, I believe the expectations on him are even higher than Soto’s were. Hopefully he lives up to them and continues to learn under Quade’s leadership. 3B – Aramis Ramirez – If Ramirez stays healthy (and I understand it’s a big IF) then he will be fine. He is playing at the end of his current contract and if he truly wants to stay in Chicago as a Cub, then 2011 is the time to prove the Cubs should pick up the 2012 option. He picked up his own option for 2011. The team has the call in 2012. Rami can put up big numbers healthy. I’ll be rooting for the trainers once again this year to see that it happens. OF – Soriano, Byrd, Colvin, Fukudome – No, I don’t think we’re playing softball. I simply believe left to right we’ll start Sori, Byrd and Colvin and Fuke will sub in where needed. I believe we’ll be seeing Reed Johnson at Wrigley a bunch this year as well. Chances that five outfielders stay healthy and produce are very slim, however, I like our chances with the guys we’ve got. They all bring something different to the table and they are a talented bunch at that. Hopefully Byrd can repeat his All-Star caliber performance of 2010 in 2011 (it wouldn’t hurt for Sori to make a return to the All-Star stage as well. Just saying). New manager: Mike Quade – Quade took a team playing for absolutely nothing and had them playing basically .600 ball. He proved to be a great leader in teaching the young stars on the team and the vets respect his long journey and knowledge he’s gathered throughout his life in the game. As of Opening Day, the entire team will be behind the idea of having him as their manager. Some more than others as some of them even went as far as publicly backing his selection before it was announced. Quade is going to get a chance to do something he’s always wanted to do and the players believe he can get them what they’ve always wanted to get. The same thing the city has always wanted to see. A title. A championship. A ring. Given all the unknowns that happen to every single team throughout a baseball season, luck becomes a great factor, indeed. However, luck is out of our control as it is every other team in baseball so as for things we can control, I think the ingredients and potential are there. Let’s hope the execution and results show up as well. Respect to the rest of the Central, the National League and the Red Sox (that’s right, the Red Sox…I don’t even think the Yankees are making the playoffs in 2011). I think it’s going to be a tough road to get there, but after 102 years…come on…we don’t expect it to be easy…and we’re due. Why not us? A Cubs fan predicting the Cubs will win the NL Central and then go on to win the World Series. Ok, now seriously, calendar…get moving! Looking forward to hearing from any one that might have any news or pics from Cubs Con and of course, pitchers and catchers in a month! This post was 100% inspired by the above photo. Quite possibly my all-time favorite movie character and Chicago fan, Clark W. Griswold, Jr. In “Christmas Vacation”, Clark is seen wearing a Bears hat and a Blackhawks jersey. I have to believe the man is a Cubs fan. I just don’t see White Sox in him. Ever the optimist, Clark looks above and beyond the challenges ahead and often times doesn’t even know they exist. Completely oblivious or completely blinded by his optimism, this is what many would believe to be a great way to go through life. You know the man must have had season tickets to the Cubs for him and his entire family. He may have won them on another game show with Ellen and the kids dressed as pigs or some other farm animal. Or maybe one year, instead of putting in a swimming pool, he got everyone seats along the first base line. Cousin Eddie: “But I don’t like baseball, Clark”. Clark: “I know that Eddie”. Clark has to be a Cubs fan because he just has that excited look in his eyes even when his strained smile tells you things aren’t going his way. He won’t take no for an answer when it comes to having a good time and providing those around him with one as well. Sounds like Cubs fan to me! 102 years and counting? I’d say that’s not taking no for answer if nothing else is! And you know Clark would be THRILLED the Cubs pulled off the Matt Garza trade. Clark: “Surprised, Eddie? If I woke up tomorrow with my head sewn to the carpet, I wouldn’t be more surprised than I am right now.” You know he’d go out and buy the new Garza jersey to wear to next season’s opener if he didn’t already have an old one with the last name GRISWOLD already sewn across the back ready to go. 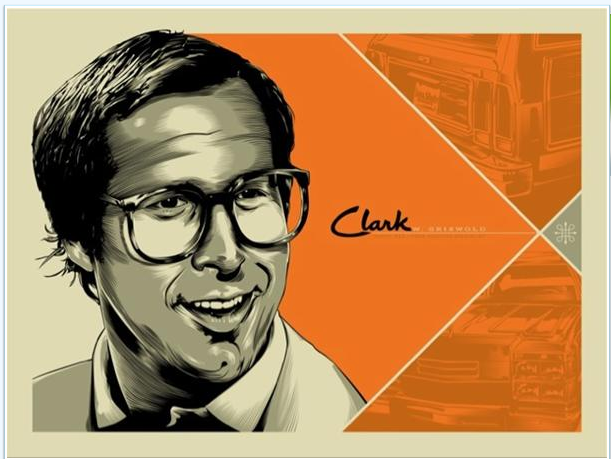 Clark W. Griswold, Jr. would be the type of fan with season tickets who wins the drawing for a season ticket holder to sing the seventh inning stretch. Only when they decided that they’d have to cancel his opportunity to do so when Jeremy Piven showed up, he’d pretend to have a gun and force them to let him sing. Is there a fan jail cell at Wrigley? Probably, would Clark end up in it? Of course not! He’d talk his way out of trouble with the Ricketts by introducing his family and getting them to admit that they never should’ve done those crappy Way of Life radio ads to save a buck. He’d then pack up the family and travel across the country to catch the Cubs play a road game on the kids’ holiday break. (It would have to be a road game of course…the song ‘Holiday Home’ doesn’t have the same ring to it). Spring Training Vacation is a movie I would love to see. Clark and the family drive from their modest home on a ***-de-sac in Illinois, across the plains to Arizona. Kick off the trip with a round of “Take Me Out to the Ballgame” in which Rusty refuses to sing along. Have them check into the motel and send Clark out for a night swim where he runs into Cubs fan Marisa Miller at the motel pool. Marisa Miller: “I am a big fan of Fukudome. Do you like Fukudome?”. Clark: “This is crazy, this is crazy, this is crazy”. Of course things don’t go well when they arrive at HoHoKam Park and hilarity ensues. Cousin Eddie’s boy has been signed by the Cubs as a Spring Training invite and Rusty ends up going off and getting into trouble with the local radicals. It all ends with Clark as the hero giving his family a great family vacation at Cubs Spring Training and of course this film features all new kids playing the Griswold children once again! Anyway, kind of got away from me at the end, but you get the point. Love the photo and yes, I believe Clark W. Griswold, Jr. HAD to be a Cubs fan. He’s just too likable to be a White Sox fan. Go Cubs Go! Let’s win one for the Grizzer! First Soriano. Then Fukudome. Now…Garza. I’ll Never Learn. There he is. Matt Garza. The Cubs new starting pitcher. Potentially our new ace in the hole. And when it comes to the Cubs making moves in the off-season, it causes me to spend an entire Winter displaying the worst poker face in all of baseball. It has to be based on the fact that it’s been forever since the Cubs won a Series, couple with the fact that the two chances we’ve had to get the shot most recently resulted in an 0-for-6 showing against the Dodgers and D’backs combined respectively. The Cubs make one move and I already think next year is going to be the year. It’s pathetic really. When will I ever learn? Probably never. I guess that’s part of the fun though in being a baseball fan, right? Especially in being a Cubs fan. No one utters This is the Year or Wait Until Next Year like a Cubs fan. As if Pena wasn’t enough (and really, he wasn’t….merely replacing Lee’s bat in the line-up wasn’t exactly what I thought was the move necessary to put us over the hump), then the Cubs go and bet the farm on Garza. About that. People saying the Cubs bet the farm? I think it’s overblown. We gave up a couple of top prospects and talented, hard-nosed outfielder we have no plans on ever really using again. Other wise, we kept top pitching in addition to Vitters and a number of other young top prospects in the organization, safe and sound. Enough about the Cubs betting the farm on Garza….although if we did, I might be ok with that. I’m just glad we didn’t have to. Pitching wins championships. By trading for Garza our starting rotation is now one of the best in the National League, arguably the best in the Central although I believe we lose that argument to the Cardinals. It definitely helps us hang in there for the NL Pennant though if we can make our way to the playoffs, even with power house Philadelphia bringing in Lee to team up with the rest of their Fab Five. Garza, Dempster, Zambrano, Wells, Gorzy? With the quality starts our rotation posted last season plus Garza’s potential coming off a 15-10 pitching in the uber-competitive AL East I think this is one of the best Cubs rotations I’ve seen. I know…this is how I get when a big name becomes a Cub. I can’t help it. The Cards have great pitching. The Reds came into their own with their young pitching staff. The Brewers landed Greinke. 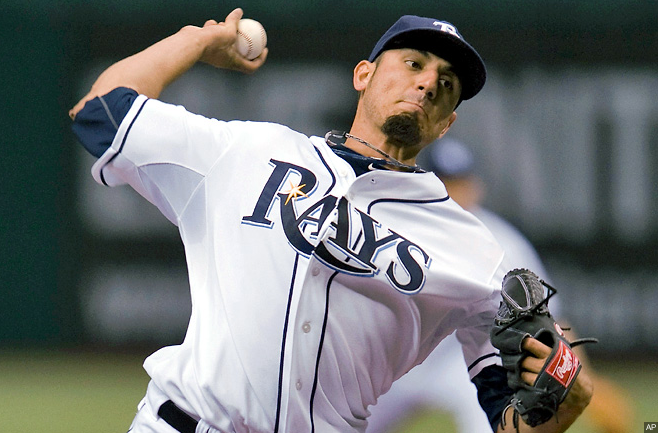 And now the Cubs snatched up Garza. I’d rather have Garza than Greinke. How about you? How does this trade make you feel about 2011? The 2008 team was probably the team I’ve been most excited about in recent years. With the addition of Garza, right or wrong…I think I’m even more excited about 2011. Please Cubbies…don’t prove me wrong.